1 Mash potatoes in a large bowl. Stir in cheese and 1 Knorr® Garlic MiniCubes; set aside. 2 Roast guajillo peppers in a medium skillet over medium-high heat until slightly softened, about 2 minutes. Remove from skillet and cool slightly. Cut pepper in half lengthwise and discard seeds. Soak peppers in 2 cups boiling water until soft, about 20 minutes. Remove from water, reserving water. Scrape the pulp from peppers, discarding skins; set aside. 3 Cook onion in a medium skillet over medium-high heat until tender, about 8 minutes, stirring occasionally. Stir in tomato sauce and cook about 5 minutes. 4 Process pepper pulp, sauce mixture and remaining MiniCube in a blender until smooth, adding reserved water as needed. 5 Heat oil in a large skillet over medium-high heat and fry tortillas, one at a time to soften, about 10 seconds; drain on paper towels. Divide potato mixture onto tortillas. Roll up and secure each with a toothpick. 6 Fry flautas in batches in same skillet until crisp, about 1 minute, turning occasionally. Drain on paper towels. 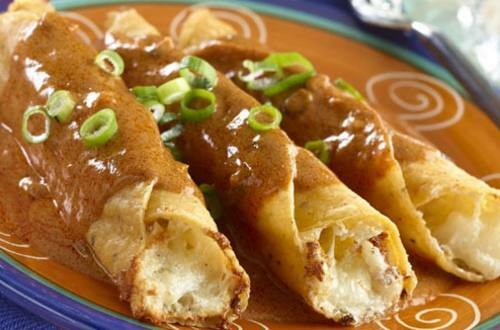 To serve, top flautas with sauce. Garnish with chopped green onions.